Roman tombstone of “Bodica” found in Cirencester. An Ancient City Is Discovered Underwater. What They Found Will Change History Forever. CT scan reveals mummy inside Buddha statue. 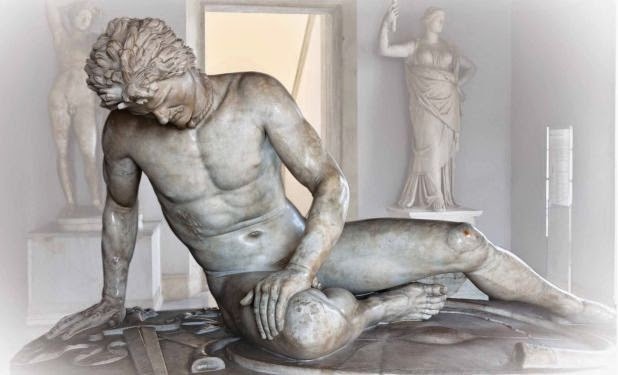 The marble sculpture of The Dying Gaul is a Roman copy of an original Greek work of art, now lost but thought to have been first cast in bronze. The sculpture is a moving portrayal of a fallen warrior, bleeding fatally from a sword wound to his chest. He leans heavily on one arm, his face contorted by pain, his shield, sword, and trumpet beside him.The initial work was created to commemorate Pergamon’s victory over the Gauls during the 3rd century BC, and it may once have stood in the Greek city’s sanctuary of Athena. The sculpture was discovered during the 1621-1623 excavations at the Villa Ludovisi in Rome and became part of the private collection of the Ludovisi family, before being acquired by Pope Xll for the Capitoline Museums in 1737. At the end of the 18th century, the Roman copy was one of the many art treasures taken by Napoleon’s soldiers during their campaign in Italy. It was displayed at the Louvre museum in Paris, before being returned to Italy in 1816. 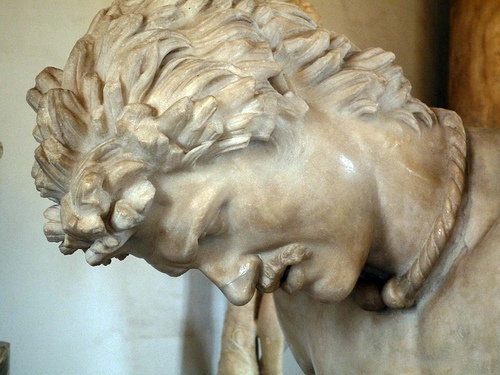 The Dying Gaul Sculpture This sculpture is so beautiful. The head of The Dying Gaul Sculpture One of the most magnificent sculptures I have ever seen. When discovered in the 17th century, the sculpture was believed to represent a fallen gladiator. It was not until the 18th century that the distinctive moustache, the matted hair and the neck torc were recognised as symbols indicating that the wearier was a Gaul. These fierce fighters often went into combat naked. Indeed the 2nd century BC Greek historian Polybius writes in his histories that ‘very terrifying too were the appearance and gestures of the naked warrior’. The statue is a marble copy of the earlier 3rd century BC version, probably brought to Rome during the 1st century BC-perhaps because it reminded the Romans of their own victory over the Celts. The sculpture is an enduring symbol of conquest. Yet rather than glorifying the victor over the victim, it is a sensitive and moving portrayal of dignity in defeat, showing respect for the noble enemy. The skillfully carved features of the dying Gaul’s face bare witness to the warriors last moments, his powerful body succumbing to a mortal wound, but, at this moment of transition from life to death, he assumes heroic status, Lord Byron described the emotion portrayed by the sculpture thus: ‘ He leans upon his hand-his manly brow/ consents to death, but conquers agony. 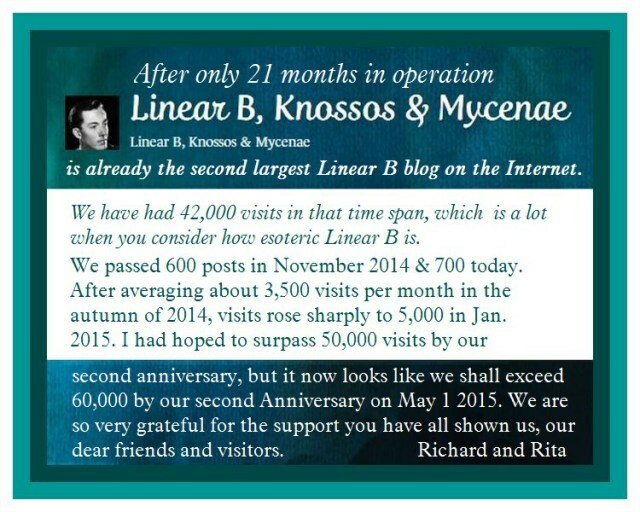 I thought my fellow bloggers would like to see the progress Richard and myself are making with the Linear B ancient script writings and thanking you for your support. This is a lot for something as esoteric as Mycenaean Linear B. With our profoundest gratitude and thanks.